I’m all about multi-tasking. If I can do more things at once, I would. It only makes sense to me to try and save time. That rule also applies to when I’m in the bathroom. No, I’m not talking about reading while in the bathroom – LOL. 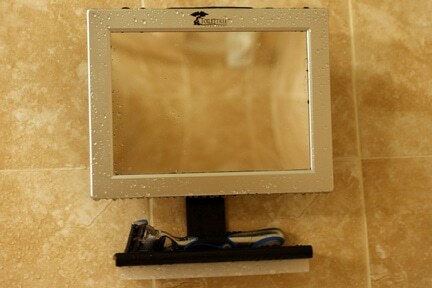 But one product that makes life much easier is the ToiletTree Fogless Shower Mirror. Finally a fogless shower mirror that actually remains clear in the shower – and sticks to the wall! Our patent-pending design is simple yet most effective. Fill the shower mirror’s reservoir with hot water from your shower head and you’re done. It’s ideal for close shaves, cleansing and exfoliating, removing make-up, tweezing and more. Before you can even begin using the ToiletTree Fogless Shower Mirror, you have to install it. The box contains some silicon adhesive that you apply to the clean surface of your shower. Then, you carefully position the black support piece onto the wall and let it dry for about 24 hours. After it is dry, you slide on the actual mirror. The mirror consists of the reflective surface and a water reservoir behind it. The mirror can be rotated up or down to suite your best viewing angle. The wait for the adhesive to dry is well worth it, because once the mirror is installed, you can shave, brush your teeth, floss, or even pluck your eyebrows IN the shower. To make sure the ToiletTree Fogless Shower Mirror stays fogless, you simply fill the water reservoir with hot water. This brings the mirror up to the air temperature in the shower, preventing the fogging. The mirror is staying fogless without any coatings or chemicals, which means that the fogless protection won’t fade. Two other features make the ToiletTree Fogless Shower Mirror very convenient – the small ledge that you can use to rest your toothbrush or razor and the little squeegee that you can use to clear any water spots from the mirror. The squeegee is conveniently stored in a little slider rail on the shelf, so you don’t have to worry about losing it. In addition, being able to follow your skin care regimen in the shower is a huge benefit. Picture being able to scrub your face after all of the pores have opened up – that’ll give you a deep down clean. After testing, I totally understand how the ToiletTree Fogless Shower Mirror was the best-selling beauty item on Amazon in December. It does exactly what it says – allowing you to use a mirror in the shower that you won’t have to constantly wipe to remove the steam. You can tweeze, brush, shave, floss, and wash your face in the shower. It’s a great gift for men and women alike. (Hint – Father’s Day and Mother’s Day anyone?) You can purchase ToiletTree Fogless Shower Mirror on Amazon for just $29.95. One winner will receive their very own ToiletTree Fogless Shower Mirror! Leave a comment telling me why you’d like the ToiletTree Fogless Shower Mirror. +1 if you follow ToiletTree on Twitter. Please note that this giveaway is open to BOTH US and Canada! Giveaway ends at 11:59 PM EST, May 12, 2011. I’d love to win this for my husband! He always tells me that it’s nearly impossible for him to shave in the shower due to not having a mirror (and when he does have a mirror, it fogs up!). This would be fantastic for him! I ‘like’ ToiletTree on Facebook. following The WiC Project on Twitter. I’d like it so my hubby can shave in the shower. I like it because it doesn’t fog up and would be great for shaving. Thanks! “Liked” ToiletTree on Facebook and told them you sent me. “Liked” The WiC Project on Facebook. I’d love to win, as I’d like to shave my face while still in the shower. That and I love to look at my self. I’m a handsome devil. It would be great to have the ToiletTree Fogless Shower Mirror in our home. I am really tired of my husband and son shaving in the sink and leaving shaving cream residue and other nasties behind. If they could shave in the shower with a mirror, I would not be cleaning a dirty sink all the time! I am a fan of Toilet Tree on Facebook. I am following Toilet Tree on Twitter. I am following your blog publically on Google Friend Connect. GFC ID: dod. I am subscribed to receive your emails using [email protected] and enjoy reading them. would like to win this for my husband – he could use it! like wic on facebook lisa w.
I would love this mirror for my son. He shaves in the shower including the middle of his unibrow! This would keep it even. I would like to win the mirror for my husband.I think a bit of useful vanity (no rough stubble) would cheer him up mightally. I would love to win this for my husband. 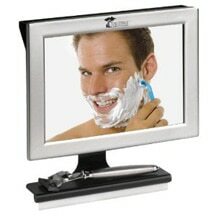 This item would be great for him to use so that he can shave in the shower! I could probably get him to rinse his recently shaved hairs down the shower drain, since half the time he doesn’t rinse the sink. Plus, I’d love to be tweeze my eyebrows in the shower. I would LOVE one of these for when I use face masks or even just to scrub off all my makeup while I’m in the shower. I would like to see what i’m doing like while shaving in the shower! I liked ToiletTree on fb! I liked The WIC Project on fb! I’d like the ToiletTree Fogless Shower Mirror for my husband to use for shaving. I’d like to win so that I can see my own beautiful face smiling back at me while I’m in the shower. My husband would LOVE to have this fogless mirror so that he could shave in the shower!!! I would love it so that I could see when I wash my face and rinse masks, haircolor, etc. It would be wonderful!!! I would love to win this for my husband so he can shave in the shower, thanks! I would like this for my husband so he can shave in the shower. I would like this for my husband & son to use in the shower. I’d like to have the Toilet Tree Fogless Shower Mirror to give my husband for Father’s Day…….so he can shave in the shower! I would like to have this for my teenage son to use to shave in the shower. i would love the toilet tree fogless mirror for my husband, he loves to shave in the shower but hasn’t found a mirror that wouldn’t fog yet! I would love this for my husband, who likes to shave in the shower. I’d love to win one so that my hubby can shave while I shower! I would like this mirror so that the men in my family (husband and two sons) could shave in the shower. That would be the end of all the hair stubble in the sink! I would love this mirror. It’s a hassle to shave and then take a shower. Being lazy doesn’t help a lot. Being able to shave and shower at the same time would be a lot of help. I am a fan of WiC on facebook and of Toiletree on facebook. I want to win this so my husband will shave!!! Thanks for the giveaway…we would like a ToiletTree Fogless Shower Mirror to replace the old, scratched, & not very “fogless” mirror we currently have in our shower ! My husband’s mirror fell off the wall and broke so i’d love to surprise him with a replacement. i would love this, looks very useful and would solve so many of the problems we encounter every day.